For you the sentence is harder... You have to live! "Abslom Daak... you have been been found guilty on 23 charges of murder, pillage, piracy, massacre and other crimes too horrible to bring to the public attention. There are two choices: death by vapourization or exile D-K!!" "Vapourization doesn't hurt... I'll take Dee-Kay!!" "You know what this entails?" "Then may your god have mercy on your soul. Take him away!" Way back in 1980, a little comic strip appeared in the fledgling Doctor Who Weekly. It was called Abslom Daak, Dalek Killer. This site is a celebration of "the Daleks' other greatest enemy," and his chain-sword weilding adventures. Starburst Magazine has posted a likely list of actors for the all-important role. 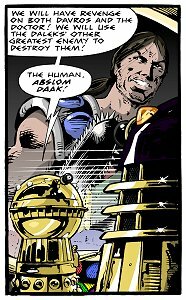 The first three Daak strips are back in print with the collection Nemesis of the Daleks. Still no Emperor of the Daleks, tho. Abslom Daak's wikipedia page was deleted, due to Wikipedia's continued valiant and worthwhile effort to preserve bits on the Internet. But fear not, the TARDIS wikia is picking up the slack. Now that Daak is canon, I eagerly await my action figure. Stuart from Altered Vistas tells me that they are releasing a computer animated adaptation of the original Abslom Daak story this weekend. Included with the introductory story is a 20 minute documentary on our favourite anti-hero, and a music video based on the DWM flexidisc theme tune. See their site for images and information. It looks pretty amazing. What's more, Stuart says, "Copies are available worldwide for only the cost of a blank CD and return postage and packaging." Well, one Dalek anyway. I'd be remiss if I didn't at least acknowledge that the most feared race in the cosmos was back on TV (this weekend in the UK, a week and a bit later here in Canada). My hit count's definitely gone up this week. I don't have any new content to put up to celebrate, sadly. (I'm working on stats for GURPS for a Dalek Killer campaign...). I should, however, point out Abslom Daak's wikipedia entry. I'd contribute, but I think they pretty much covered it. Since I'm here, I thought I'd post some of my exciting adventures with Photoshop. Here's Abslom Daak in an exciting adventure with the Daleks. Lee Sullivan, artist for the two most recent Daak strips, Nemesis of the Daleks and Emperor of the Daleks is selling off his comic strip art from DWM (as well as his DWM illustrations for the Big Finish Audios). Included in the mix are some pages from his Daak strips. These are the originals, not prints, so supplies are very limited. Email LeeSullivanArt@aol.com directly to receive his most up-to-date catalog! (Lee Sullivan, it should also be noted, has been doing the artwork for the audio dramas that have been airing on the BBC's Official Doctor Who website). "I am Abslom Daak, Dalek Killer"
He is an interesting addition to Doctor Who mythology. Or perhaps "sidenote" is more accurate than "addition." 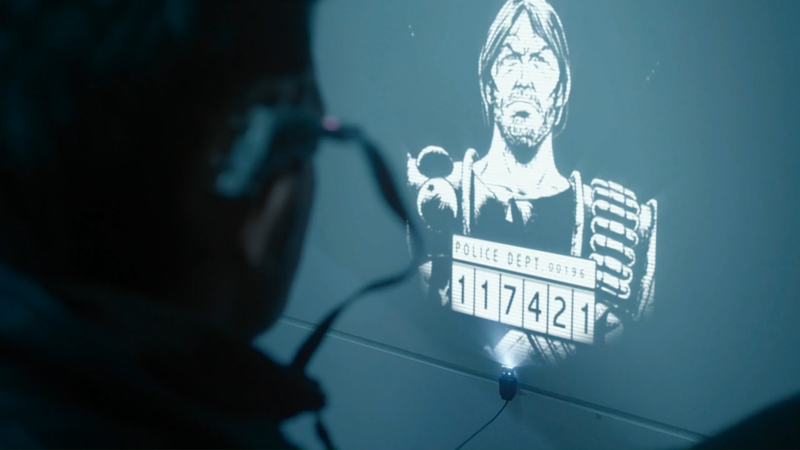 The Abslom Daak comics first appeared in the four-month-old Doctor Who Weekly in 1980. Now, twenty odd years later, Daak will still show up now and again. He's starred in four DWM comic stories, a short story in his own graphic novel, a vinyl single and has even had a special guest appearance in a New Adventure. He was a convicted murderer, sentenced to a certain death exiled deep into Dalek space with instructions to wreak as much havoc as possible before being exterminated. But Abslom Daak didn't die. This Doctor Who Time Ring site is owned by Darcy Casselman.